Intuition author Lynn Robinson credited the PR LEADS publicity service with helping her get a book contract. 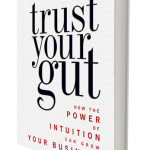 “Intuition is a gift from the Universe — from God, if you will — that will guide us unerringly to the realization of our hopes and dreams,” says Robinson, author of this uncommonly readable book. Using personal experience, beautiful illustrations, inspiring quotes, simple exercises, and stories from thousands of clients, Robinson demonstrates that intuition is a gift from the Universe that anyone can cultivate as an unwavering and reliable source of wisdom and guidance. Do you have a success story about how PR LEADS helped you get a contract, a client, a job, a speech or anything else that’s really cool? Tell me about it and I’ll tell the world. I’ll write a press release about your success so you can build your brand, get more links that will help your website visibility on Google and help your visibility in general. I realized recently that if I don’t toot my horn, well, you know the story. So I’m collecting case studies and sharing them with the world. What’s your story? Please email me: dan@prleads.com and tell me what’s up!